The past few months have been full of transformation here at Bridge for Billions. We’ve thought long and hard about who we are, how we’ve gotten here, and who we aim to be. That’s why we decided it was time to reflect outwardly all of the changes we’ve gone through inside the company. Democratize access to entrepreneurship training and mentoring in order to create business opportunities that solve problems for billions of people. Once the goal was set, I packed my skills and all of my previous experiences and started my entrepreneurial journey. I was definitely not well equipped to hike on my own, which is why Jessica Kou joined me as a partner and little by little we gathered a small but strong team that allowed us to advance. In the beginning our team was spread across the world and, at times, we were working from 3 different continents and time zones. Despite the many adversities, we put all of our efforts into Bridge for Billions and, in 2016, reached our first checkpoint. What emerged was a minimally viable product (MVP) and 4 pilot projects with entrepreneurs from several countries. Soon after, we were getting recognition from companies, local authorities, institutions, and international organizations who saw Bridge for Billions as an ally to connect them to innovators. Now in less than 3 years after officially launching, thanks to the support of our 500+ mentors, we have supported 400+ entrepreneurs from 40+ countries. ‍Bridge for Billions’ entrepreneurs are problem solvers that come from all sectors and fields of business. Each of their journeys through our program has helped us to evolve as a product, as a team, and as a company. Today’s brand change embodies all of the lessons from the past three years, walking from the very bottom to the basecamp. Now that we’ve reached solid ground at the basecamp, we’ve stopped to take stock of where we’ve come from and where we’re going before we continue our hike to the top. Over the past few months we’ve put our sweat (and maybe even some tears!) into creating the best brand for Bridge for Billions - one that is clear, recognizable, and aligned with our values. After three years of developing our industry validated digital incubation program, The Leap, Bridge for Billions’ renovated goal is to become a global digital ecosystem that connects people to impulse growth opportunities for all its stakeholders: entrepreneurs, mentors, companies, organizations, and governments. Bridge for Billions is the architect of entrepreneurship programs -or bridges- that unlock growth opportunities on both sides. With this ambitious goal, Bridge for Billions will continue to spread our belief that innovation happens faster with collaboration. For innovators, access points to the current entrepreneurship ecosystem and high quality support are limited and costly. We believe everyone has a role to play in opening the ecosystem to extend more opportunities to the entrepreneurs of the world in order to help them solve the problems they see. Our role is to be the connector of our different stakeholders -entrepreneurs, mentors, and organizations- for the growth of all. Our online incubation platform, business tools, and methodology keep evolving too. We continuously adapt our offerings to the needs of our growing community of entrepreneurs, mentors, and organizations. We strive to develop tools and co-create resources with a key motivation in mind: changing the world, one business at a time. Bridge for Billions was founded by, with, and for entrepreneurs. The green B-shaped heart as our logo and our former identity was a good representation of our beginnings. 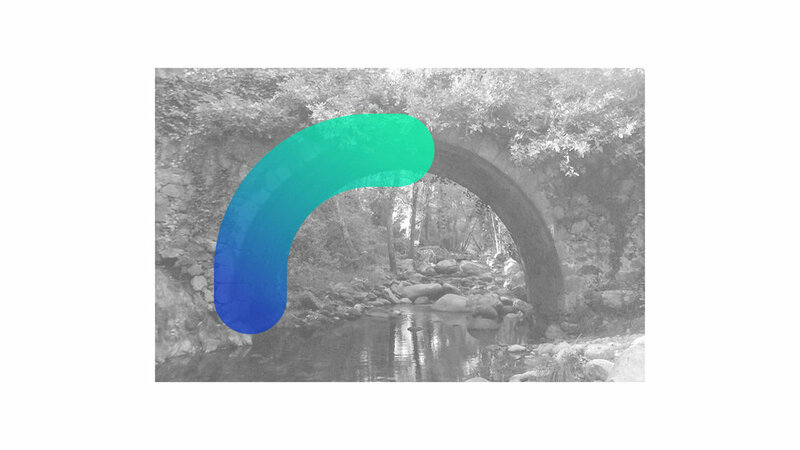 The starting point of our new identity focuses on the figure of a bridge and the idea of “connecting growth”, our tagline. We have chosen an image that clearly represents connecting one point to another, illustrating growth and the power of connecting. Bridge for Billions’ two main colors are now blue and teal, and the gradient that they form together. Blue is a color that typically expresses trust, reliability, and responsibility and we will use three tones of blue to represent our mentors. We have chosen green to express vitality, renewal, and growth, and we will use three tones of green to represent our entrepreneurs. Together these groups (and colors) come together to form a vibrant gradient. Bridge for Billions unlocks connections that previously seemed impossible and inaccessible to many. With this brand launch, we have adapted our approach and will be improving our incubation program by launching cohorts with a focus on each of our 12 areas of innovation. For this endeavor, we are seeking building partners that want to connect with entrepreneurs from these 12 sectors and grow the ecosystem. If you share our vision, come join us on www.bridgeforbillions.org and get in touch! If you want to find out about how to join our community of ecosystem builders, we will be launching online events soon where you can learn about our Leap Program for entrepreneurs or how to join as a mentor. If you are a corporate, foundation, or university interested in innovating, impacting, or inspiring with entrepreneurs, we are looking for you! We are extremely thankful for all of our users and partners that have been with us since the beginning, and are excited to start this new phase together. If you’re in Madrid, and want to join us to celebrate, get your ticket to our launch party here!